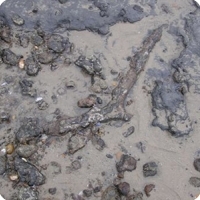 Dinosaur footprint found in armourstone at Reculver. Believed that the stone is of French origin as was shipped in to protect towers from costal erosion. Palaeocene, Eocene and Pleistocene fossils from the coast around Herne Bay. 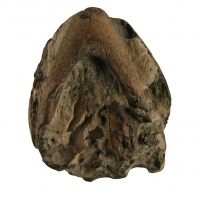 A fossil shark tooth of the species Otodus obliquus from the London Clay. 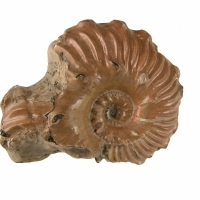 Collected by Dr Martin in 1935 from the North Kent Coast. Fossilised shark teeth can easily be found at low tides along the coast at Beltinge. 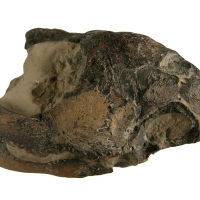 A fossil sea turtle preserved as phosphate in a cementstone concretion from the London Clay. 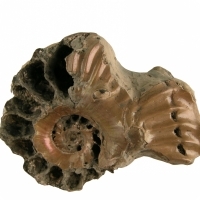 It is around 50 million years old. Fossil fish of the genus Scombrinus from the London Clay. 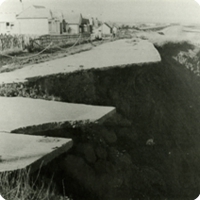 It from the museum's old collection and was probably collected from the Isle of Sheppey. It is around 50 million years old. Woolly Mammoth Tusk Mammuthus primigenius found during machine excavations at Swalecliffe Waste Water Treatment Works in 1997. 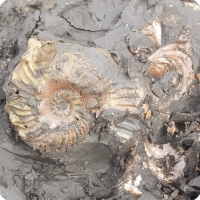 This ammonite was found in the Gault Clay by Andy Temple on the foreshore of East Wear Bay during a public walk on the 26th April 2014. The Gault Crab Cretacoranina broderipi found by Philip Hadland close to Copt Point in Folkestone. Tridactyl dinosaur footprint in a block of Lower Greensand from Folkestone. Found by Philip Hadland. Turtle skull from the Gault Clay. Found by Philip Hadland.